First prepare the streusel by combining the brown sugar, flour, cinnamon, salt, and butter in a bowl and pinch together with your fingers until it forms a crumble. Mix in the chopped pecans and walnuts and set aside. Next prepare the cake. In a bowl, sift together the flour, baking powder, baking soda, and salt and set aside. In an electric mixer fitted with the paddle attachment cream the room temperature butter and sugar for 5 minutes, until light. Add the eggs 1 at a time and then add the vanilla and sour cream. With the mixer on low, add the flour mixture to the batter until just combined then finish stirring with a spatula to be sure the batter is completely mixed but do not over mix. Spoon half the batter into the pan and spread it out with a knife and then sprinkle half of the streusel on the batter. Spoon the rest of the batter in the pan, spread it out, and scatter the remaining streusel on top. Bake for 40 to 50 minutes, until a cake tester comes out clean. 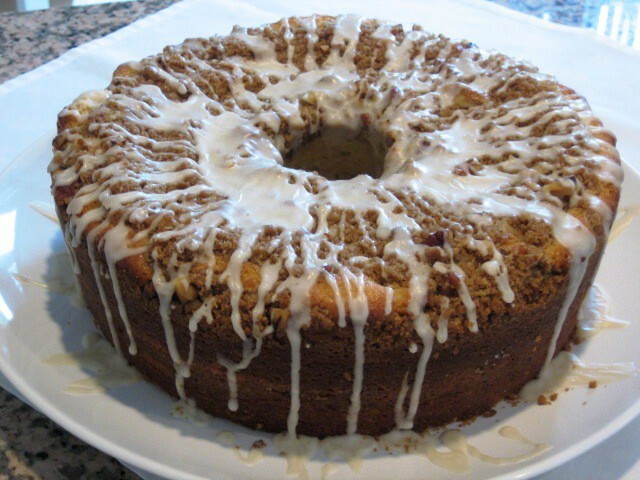 Let cool on a wire rack for at least 30 minutes and then carefully transfer the cake, streusel side up, onto a serving plate. Prepare the glaze topping by whisk the confectioners’ sugar and maple syrup together, adding a few drops of water if necessary, to make the glaze runny. Drizzle over the cake with a fork or spoon.